The entry is arguably one of the most important places in your home to really nail it when it comes to color choices. After all, you only get one chance to make a first impression, and it starts with your front door! Choosing a color for your front door can be intimidating, but not to worry; these door color selection tips from Modern Masters will help you choose a finish that creates a beautiful focal point for your home. Style– The architectural style of your home should be a major factor in your color choice. Most home styles have a color palette that works best with them; for instance, Mediterranean homes often feature earthy, sun-baked color palettes of ochre, burnt umber, terracotta, and rich, dark wood tones. Classic bungalow style also draws color inspiration from nature, but usually features cooler hues like pale gray, greige, charcoal, sage green, and taupe. 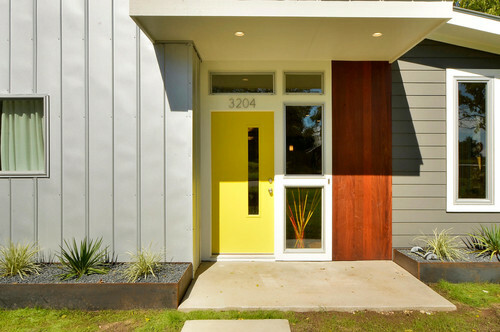 Contemporary architectural styles can look fantastic with bright, bold door colors. Coordination– In addition to the architectural character of your home, it’s also important to consider existing elements that will interact with the door color, like the color of bricks, roof material, trim, siding, shutters, and even the surrounding landscaping and hardscaping (driveway, patio, retaining walls, etc.). Remember to consider how your front door will look from the inside as well as the outside. 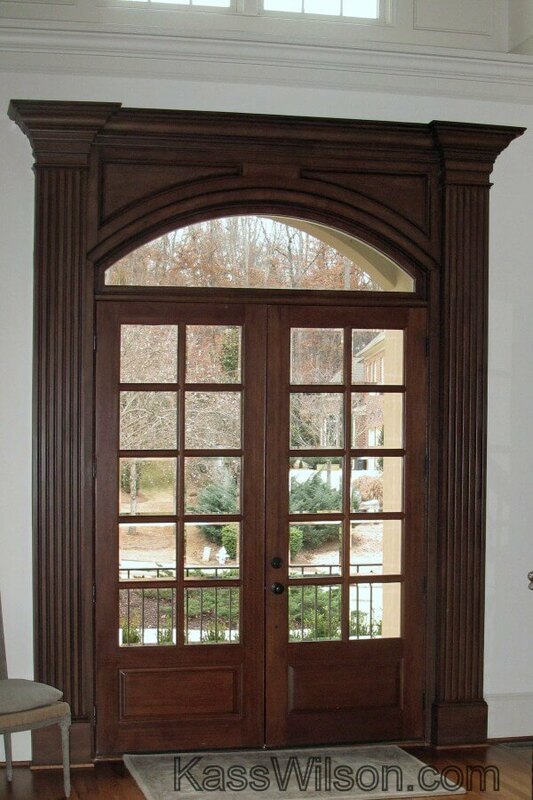 The door below was given a rich mahogany faux finish to complement the traditional style of the home while highlighting the door’s architectural features. 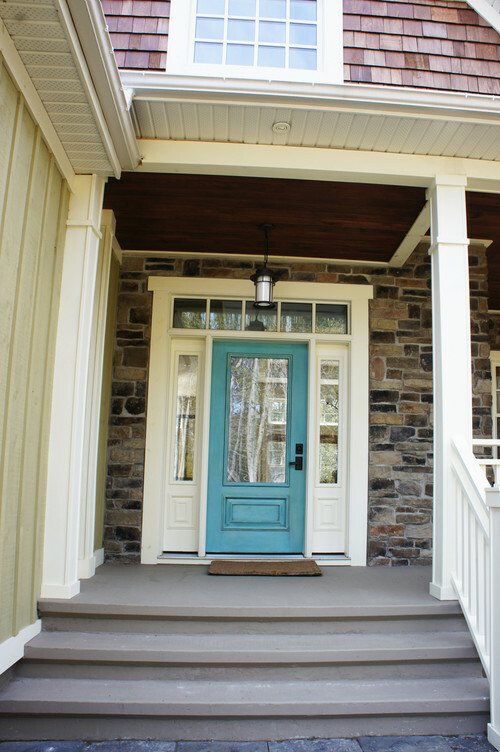 Mood– The color you choose for your front door will set the tone for your home. A classic red door can liven up a traditional home’s exterior while still maintaining a sense of classic sophistication, whereas a turquoise door can give a contemporary home a boost of energy and create a sense of quirky eclecticism. In most cases, contrast is the way to go when choosing a door color, but it depends on your home’s architectural style and your own personal style. A bold, vibrant door color may be just what your mid-century home needs, while a Mediterranean home will probably look best with dark wood. Of course, breaking the rules can sometimes yield the best results, so don’t be afraid to think outside the box. Maybe your federal style home needs an eggplant door! Fortunately with decorative painting you can get exactly the look you want for your front door! Faux finishes open up endless possibilities, from a glazed and painted door with French Country appeal to dark mahogany that sets a tone of elegant formality. To learn more about our faux finish painting services in Atlanta, contact WallsTreat Studio today. Thanks so much for the mention, Kass, on your great article!